Sharing our mechanical contracting knowledge and expertise on furnaces, plumbing, gas fitting, process piping, and more! 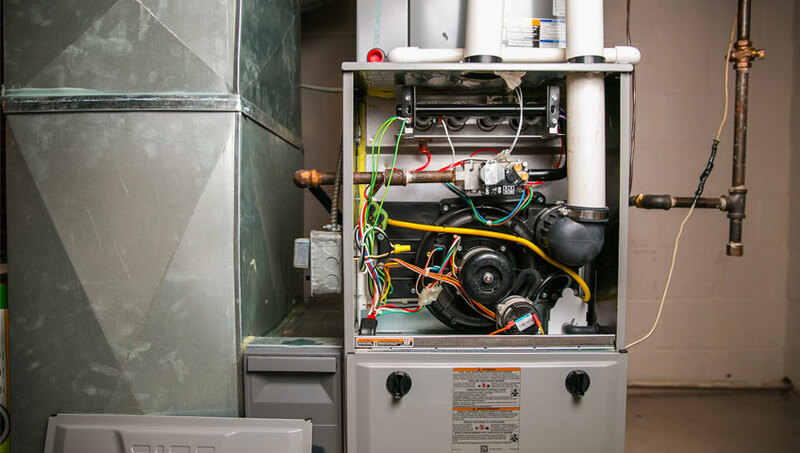 Just like any household appliance, your home furnace will no doubt reach a day when it requires some level of repair. It could be that it’s making a minor noise or, worse yet, isn’t producing consistent heat. Regardless of the issue, you’ll need a specialist (such as JW Brian Mechanical) to repair your broken furnace and have it up and running again ASAP. Additionally, after repairing hundreds of furnaces and gas appliances in the Edmonton area, one common question we’re asked is: “my furnace isn’t working, what should I do?”. You’re of course welcome to contact us and we can help with the repair, but you may be surprised to learn that you might not need us at all! With the advice shared in this guide, you may be able to troubleshoot or fix your furnace yourself. Need immediate furnace repair help? Contact Us! 1. Power is on to the furnace? As silly as it may sound, there have been times when a client has called us with a failing furnace only to discover the power is turned off. So before anything, do yourself a favor and double check that your furnace’s power is turned *on*! On occasion, on modern, high efficient furnaces, a simple reboot of the furnace is all that is required, Simply turn the power off then back on after a couple minutes. Its a long shot, but you never know till you try. Dead batteries are a fairly common problem, it is recommended to change your thermostat batteries yearly. 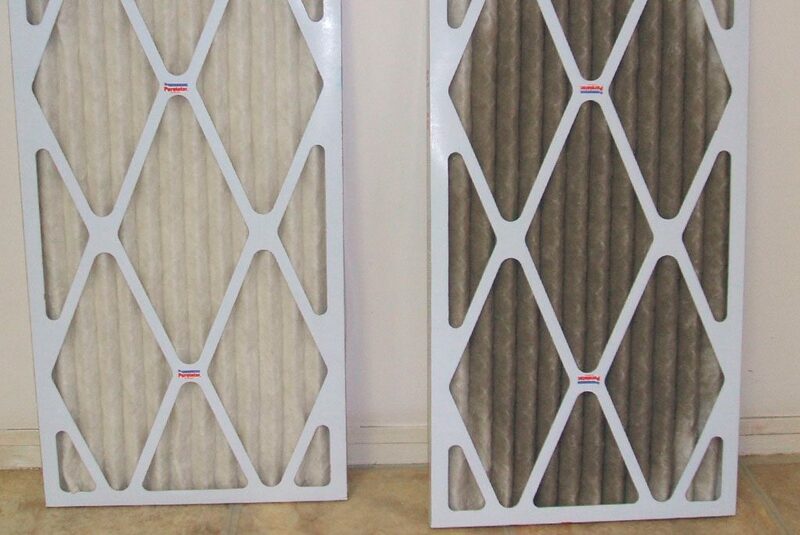 The furnace filter’s job is to protect the blower fan from dust, hair, and any other harmful contaminants that enter the furnace through the return duct. New v.s. dirty filter. If yours looks anything like the filter on the right, then it may be time for a replacement. After much use, the filter may become clogged and so dirty that it blocks the airflow and over heats the furnace tripping it out. Thus, with the furnace power turned *off*, pull the filter out from the appliance and see how it compares to a new filter (such as the image above). Filters should be changed twice a year. On high-efficiency furnaces and particularly in cities with cold winters (such as Edmonton), one of the common reasons for furnace failure is ice buildup in the air intake on the outside of the house. Check there isn’t a buildup of ice on the air intake preventing proper airflow. 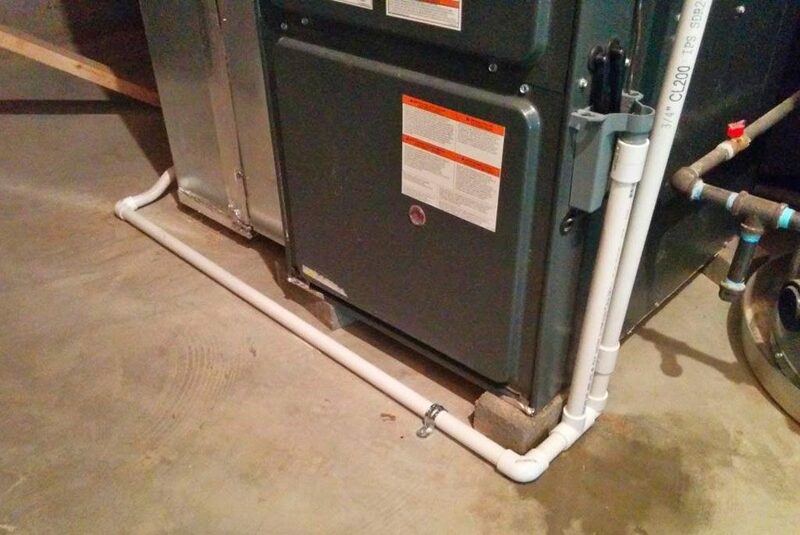 Furthermore, another frequent issue with high-efficiency furnaces is the tremendous amount of moisture and condensate produced, which must be collected in a “trap” and drained out of the furnace. Although the trap is a highly effective draining mechanism, it’s also quite rudimentary in nature and can be easily blocked. More information on condensate drains can be found at HVAC School. On a high efficient furnace, the exhaust vent, located near the air intake may be blocked with foreign objects such as ice, a bird’s nest or dead rodents. Check the vent and remove anything that may be clogging the airflow. 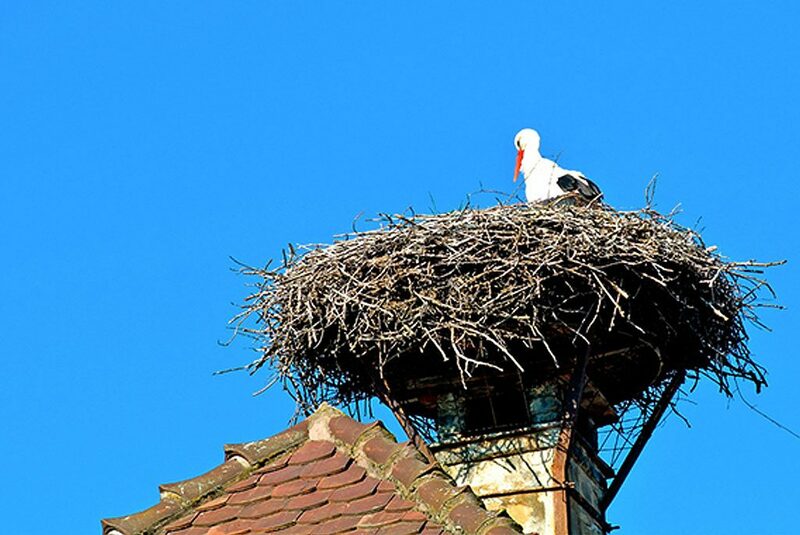 An extreme example of one of the most common causes of a plugged chimney – birds nests. On your older, old fashioned gravity vented furnaces and mid efficient furnaces, you may have a obstructed chimney.. We have have found children’s toys, bird’s nests, and even one of Santa’s boots in a chimney. A yearly inspection of your chimney is advised. In addition, if tips #1 – #8 still are ineffective in reviving your furnace to working order, then it is best to give us call. We are available 24/7 for Heating and Plumbing emergencies. 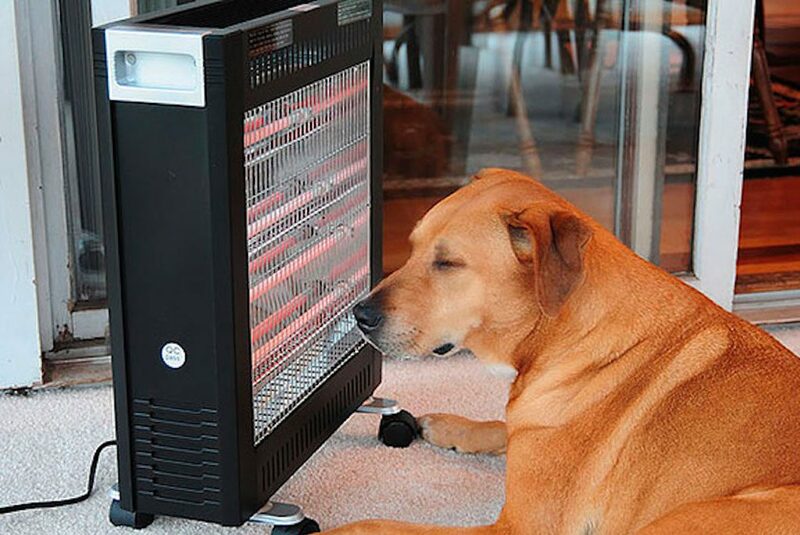 Portable space heaters are one of the most convenient (and pet-friendly!) alternate sources of heat. Lastly, if your furnace is failing to produce warm air and you are left with a cold home, then it never hurts to find another source of heat temporarily, such as a electric portable heater, fireplace, and of course, a few extra layers of clothing! Need help repairing your furnace? Let JW Brian Mechanical help! 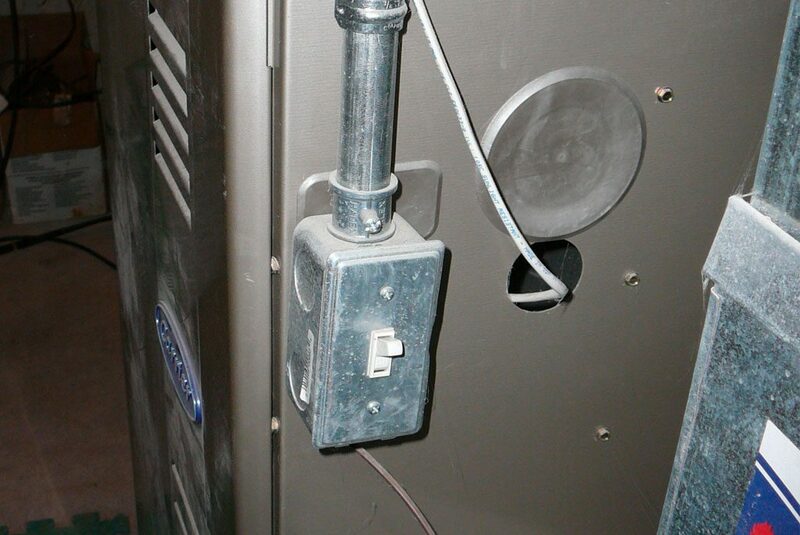 If your furnace needs repairing, please feel free to contact us at (780) 249-1496 or email us at info@jwbrian.com.